← Hallelujah . 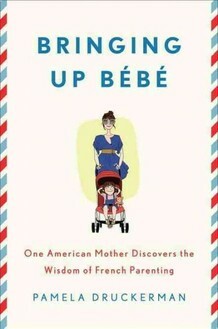 . .
A few weeks ago, we heard an NPR interview with Pamela Druckerman, the author of Bringing Up Bébé: One American Mother Discovers the Wisdom of French Parenting. We liked what we heard, and Matthew and I both requested the book at the [city] library the next day. However, our positions in the hold queue made me wonder if we’d actually get a chance to read the book before Sir headed off to college. Unlike traditional parenting books, Druckerman’s writing is witty and entertaining, part personal tale, part ethnography of French parenting, and part practical ideas to try in your own family. Like the advice in most baby/parenting books we’ve read, we’ll take some and leave some (notably, leave the negative perception and infrequent practice of breastfeeding in France). The book offered reinforcement for many practices we’re already trying to implement. Overall, Bringing Up Bébé left me contemplating a move to France, with its crèches and state-run preschools, approach to introducing food (and the importance they place on good food), and practice of integrating children into the family and society (from infancy), rather than the family’s life revolving around the child. This entry was posted in My Life and tagged baby, parenting. Bookmark the permalink. Thanks for the review- I wanted to read this book and it sounds like you distilled the good take home points in this post.